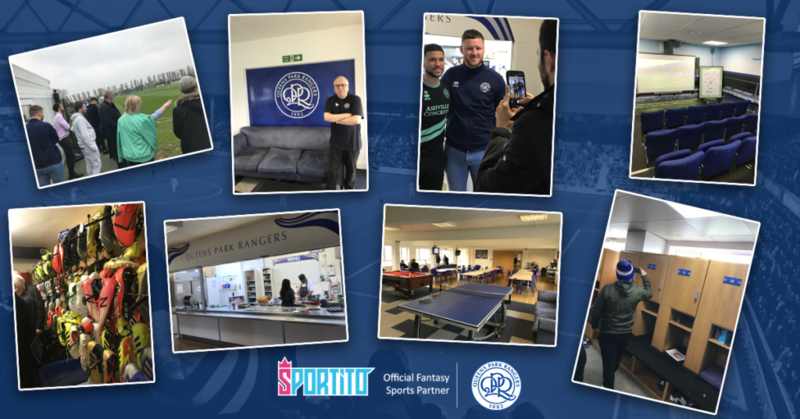 Last week, Queen’s Park Rangers invited Sportito’s latest winners, who happened to be massive QPR fans, to a behind the scenes experience at their West London training ground. I was lucky enough to be included on the guest list to observe events and to find out what the twelve lucky winners of Sportito’s fantasy football app, thought of their day. As you come up the private road to the training ground, you’re immediately met with pristine football pitches on the left-hand side, just set back slightly from the large white clubhouse. A line of impressive, mainly German automobiles, were parked on the right. After explaining who I was to security and being taken through reception; I went up a carved wooden stair case into one of the meeting rooms on the second floor. ‘Hard Work Beats Talent, When Talent Doesn’t Work HARD’. ‘I may win, I may lose, but I will NEVER be defeated’. While we contemplated a game of pool or football in the games area; we sat on large blue sofas overlooking the numerous training pitches – the sun was beginning to break through the thick grey cloud, making the recently watered pitches glisten in the morning sunshine. 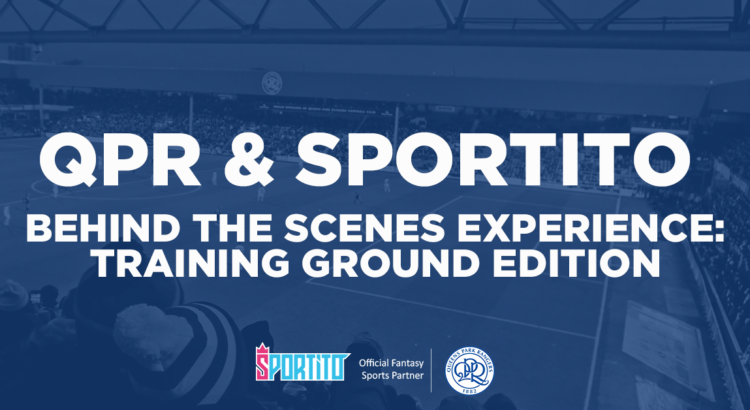 The players needed to be ready for training by 10.00am, so while they headed off to the changing rooms, we caught up with QPR’s media team who ‘walked’ the fans through a typical day at the office for them. They shared how they structure the press conferences and reminisced about chasing off TV crews during a Friday’s training session, ready for a Saturday game during Mark Hughes’ reign. After answering all of our questions, we left the media team and were taken back downstairs to continue our tour. We saw the offices, the medical department, the changing room, the onsite gym, their boot room and into the staff’s offices. This is where we met the coaches and analysts who were getting video clips ready from the previous weekend’s game. 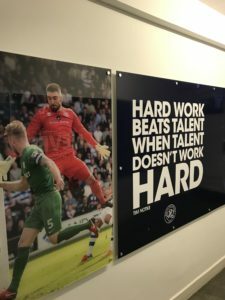 QPR has a projector room, similar to a small cinema where they review their past performances or study the opposition for the coming game. After some further Q & A with the staff, the fans were then escorted onto the pitches to see the team run out and begin their training session. As the sun was starting to come out – we all headed back upstairs to a viewing terrace overlooking Pitch A to observe. The pristine pitch was now covered with marker cones set up in large boxes with interlinking running drills. We watched for the next 90 minutes as the players frantically moved between the boxes, sometimes trying to bend their run, or sometimes they needed to beat a man before getting their shot away. There was a real excitement amongst the fans as they saw their team training hard and occasionally trying to ‘nutmeg’ one another. Once training ended, we all went back inside and waited to meet the players as they went for lunch. Before the players joined us, however, the Care Taker Manager John Eustace stopped by to have a chat. The fans really appreciated the time he took to answer questions and share his thoughts on the current situation at the club. 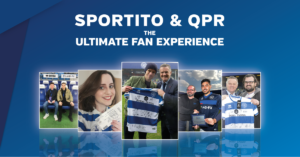 Afterwards the players met the fans and also chatted about, you guessed it…QPR and the run into the end of the season. After a lot of pictures were taken, and QPR memorabilia were signed, the players headed off to the canteen for lunch. By about 2.00pm, it was our turn to have lunch in the canteen cooked by the in-house chefs. There was a number of choices on offer such as chicken breast with mushroom sauce, or a very tasty pork curry. There was lots of salad, cuscus and fruit on an island counter which everybody topped up their plates with. Seeing the players and experiencing the diet of a professional footballer rounded off a great day! One of the fans memorably stated, “it’s like a dream day out really’’… “instead of going to work, you’re at your favourite football team’’. Following a lovely lunch, the fans all said their good-byes to one another and then headed home.